It was a beautiful Southern California day, a day like every other. Blissful. Only this time it was summer. Fred & I decided to enjoy the afternoon with a little barbecue, a grill & chill if you will. 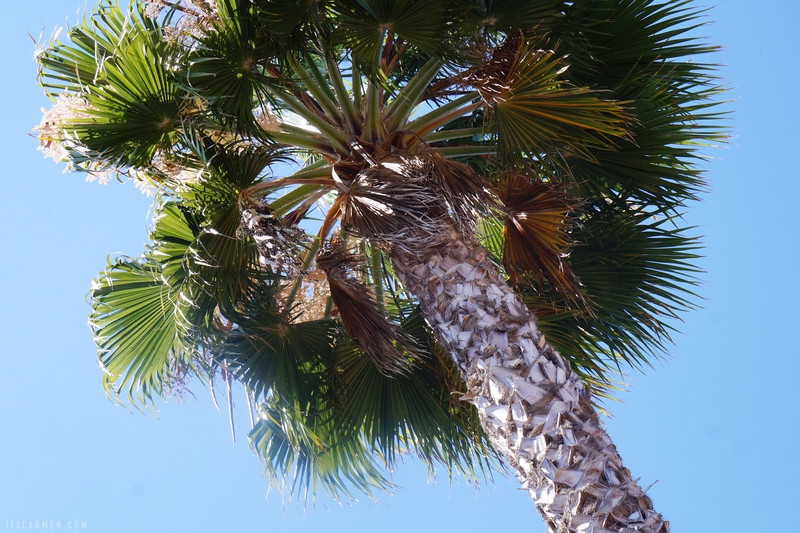 We sought refuge from the warm sun rays under the orange umbrellas & whispy palm trees. Before anything, we started off with a round of grocery shopping, then we prepped the veggies, gathered our cooking utensils & seasonings, & headed off to the pool to begin our vegetarian BBQ experience. I opened myself an apricot La Croix & set up the table while Fred placed the chopped zucchini & baby yellow squash on the grill. 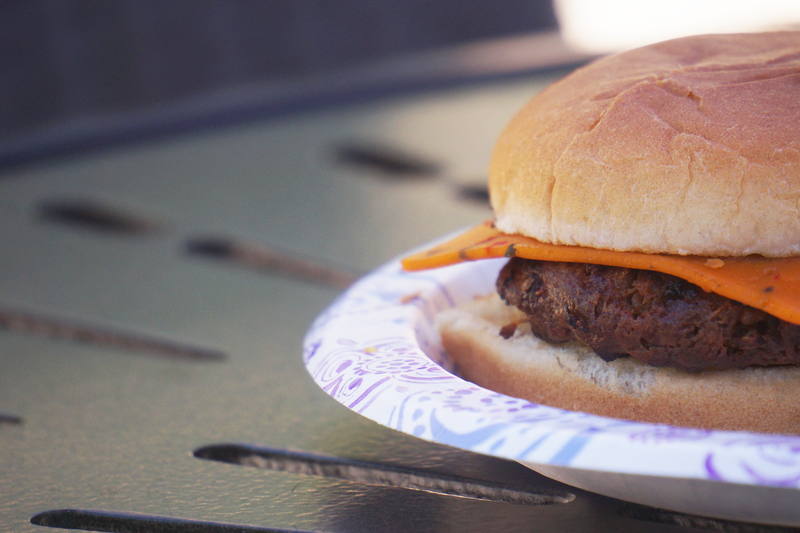 Then he added the Field Roast* Hand-Formed Burger & served himself an ice cold beer. What better way to spend a summer's day? Fred played some music on his phone to set the mood as we completed the finishing touches. 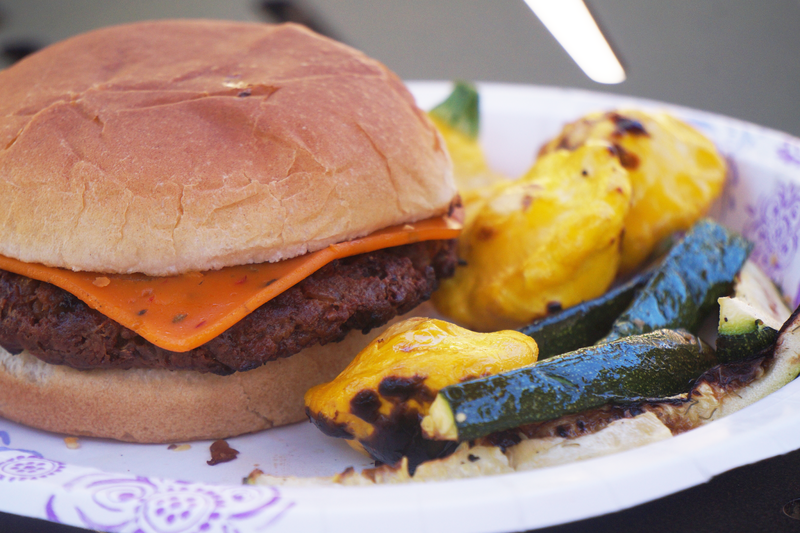 The burger & veggies acquired delightful grill marks — like the ones you see in commercials. 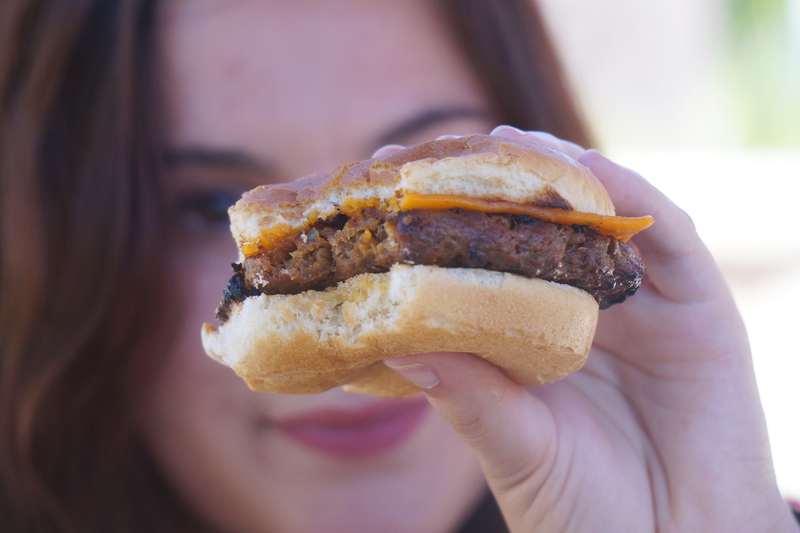 Once everything was practically done, we added a slice of the Chao Tomato Cayenne vegan cheese, also by Field Roast, on the burger to melt. We turned everything off, plated our food, took some photos (of course! ), & then dug in. Grilling gives food such incredible taste, a rich smokiness. The burger was thick & flavorful, while the BBQ gave it great texture & bite. Although it had a difficult time melting, the tomato cayenne queso made the perfect alternative to ketchup; I didn't even use any! Fred said the burger was "tasty & filling." I noshed on the veggies in record time. I simply added a sprinkle of garlic salt & seasoned the zucchini with a little dill. Pure delight. The BBQ'd veggies were something else. Totally packed with flavor. We rarely barbecue so it gave us a bit of adventure. Vegetarian & vegan-friendly foods have made strides in last few years. 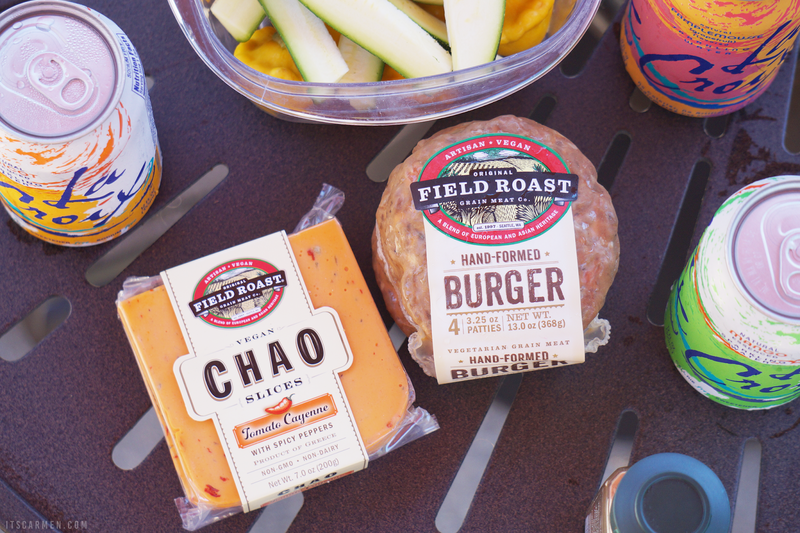 Products & brands like Field Roast give me the opportunity to participate in BBQs & summer traditions without having to skimp out on the yummy stuff. That's what food & friends & barbecues are all about. Good food. Good drinks. Good music. Good weather. Good company. Good days. 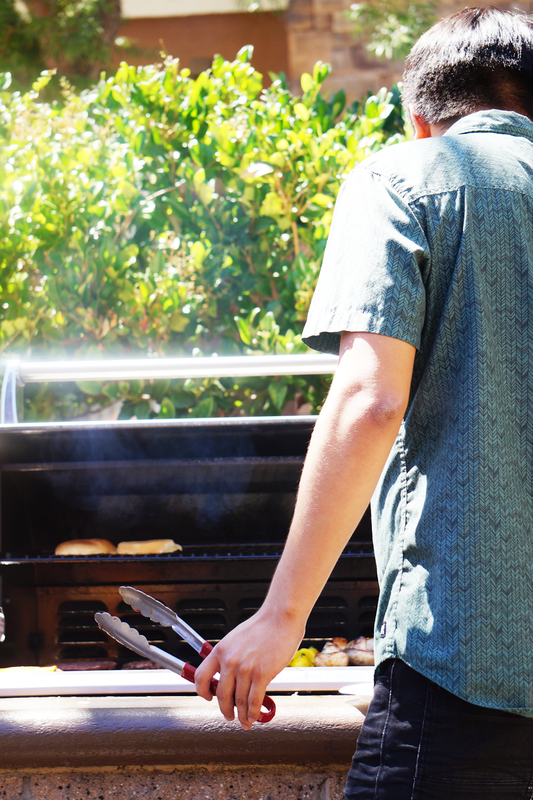 You can't go wrong with a BBQ in the summer! Those burgers look delicious. I'm seriously hungry after looking at those gorgeous photos! im a vegeterian too so this is great! The food looks amazing and it's so great that it's vegetarian too! It's making me so hungry just looking at them, especially those burgers! Lovely photos-- looks like the epitome of summer. Good food and good company is all you need on a summer night! I love vegetarian burgers as they are more delicious than normal ones (for me at least!) and they are easier to digest before going to bed! Lovely post! I need to look into Field Roast's vegan burgers, as we have cut back on meat tremendously in my house and are always looking for substitutes; this looks amazing! Thanks so much for sharing and I hope you have a great week! Mmmm delicious! 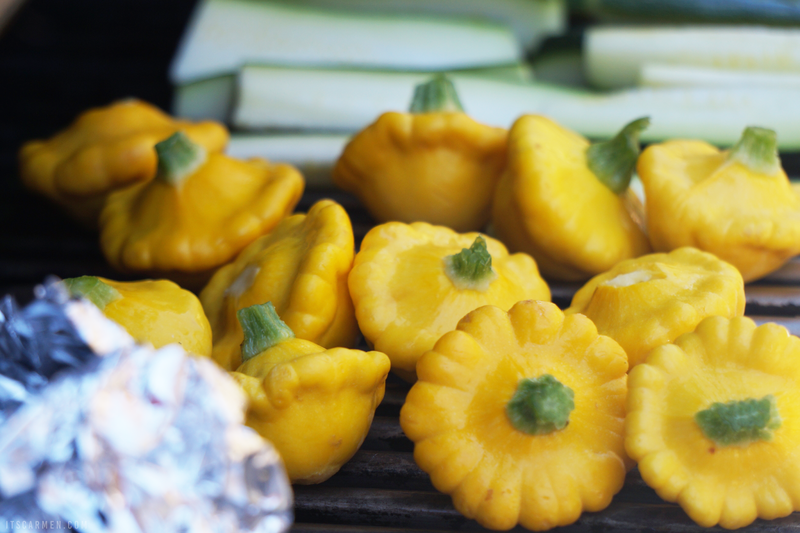 Us veggies still love a good BBQ too! You've made me feel so hungry! Grilling just feels like summer, and this looks awesome! Makes me hungry. Wow this looks really delicious Carmen, perfect idea for a summer BBQ! 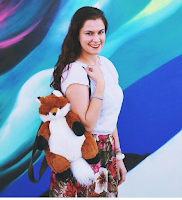 Thanks for sharing and happy August! Sounds like the perfect afternoon and the burger looks delish! Oh wow.Everything looks so appetising.Yummy looking pictures there. That sounds like such a delightful afternoon! Those veggies look so yummy!